This is the last edition of the only reference book we ever published. The goal of this book is to combine all the reference information that a CICS/COBOL programmer needs into one handy, easy-to-use source book. That means it gives you the information that you would otherwise have to dig through the IBM documentation to find. Beyond that, though, this book gives you advice and coding examples that even the manuals don’t provide. Today, it no longer makes sense to update a book like this because the mainframe book market has become so small. But if you’re working on an IBM mainframe, most of the information in this book is still useful, especially when you’re maintaining legacy programs. One reason for this is that IBM has always prided itself on the upward-compatibility of its software. 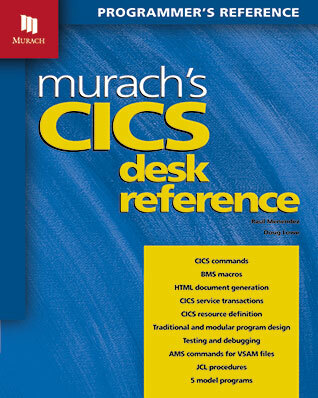 A user-friendly, information-packed resource filled cover to cover with sample code, examples, tips, tricks, and techniques, Murach's CICS Desk Reference is an excellent and recommended guide written especially for experienced CICS/COBOL programmers looking to save time and headaches when they need to look up reliable information quickly." This reference book assumes that you already know how to develop CICS/COBOL programs. If that isn’t true or if you’re just getting started as a CICS/COBOL programmer, we recommend that you get Murach’s CICS for the COBOL Programmer. This book has taught CICS to more than 200,000 COBOL programmers, and it presents all of the skills that are essential to effective CICS programming. Units 1 and 2 summarize the design and programming guidelines that are presented in our introductory book, Murach’s CICS for the COBOL Programmer. If you adhere to these methods, you will work more productively, your programs will run more efficiently, and your programs will be easier to debug and maintain. Units 3 and 4 contain the information you need to compile, test, and debug CICS programs, including how to plan the testing phase, how to use CEDF, and a description of the most common abend codes. Unit 5 presents two versions of a model maintenance program. The first one presents traditional design and coding techniques (the ones you’re likely to find when you’re maintaining programs). The second one presents modular design and coding techniques that separate the user interface from the business logic. Unit 6 presents model programs for three other types of programs: a menu program, an inquiry program, and an order entry program. When combined with the programs in Unit 5, this gives you a wealth of design and code that you can use as models for your own programs. Units 7 and 8 provide detailed reference information for coding CICS commands. Here, you’ll find syntax diagrams along with explanations of options, exceptional conditions, and coding considerations for 121 CICS commands. You’ll also find lots of coding examples that show you how to use these commands in their proper context. Units 9 and 10 give you the same type of reference information for coding BMS mapsets. After Unit 9 gives you syntax, examples, and guidelines for coding BMS mapsets for 3270 displays, Unit 10 shows you how to assemble your BMS mapsets into HTML templates so they can be displayed in a web browser. Units 11 through 13 present information that helps you work more effectively in the CICS environment. This includes how to use: Access Method Services to define and manipulate VSAM files, RDO to define resources for an application in a CICS test region, and the master terminal transaction (CEMT) as well as several other CICS-supplied transactions. Unit 14 presents reference tables that come in handy during many phases of program development: hexadecimal conversion tables, the EBCDIC character set, and so on. Here are some of our other books on subjects related to CICS. All of them have been and still are the best-sellers on these subjects. Our classic book that has taught CICS to more than 200,000 programmers. Because its unique design lets you learn new skills whenever you need them, this book is a great companion to the CICS Desk Reference. 2 books in 1! A fast-paced training guide for COBOL beginners and entry-level programmers…and an indispensable reference book for any COBOL programmer on the job. How to write the JCL (Job Control Language) to translate, compile, and execute your programs...and a lot more! How to write COBOL programs that process DB2 databases. This PDF file contains the pages for 8 of the 121 CICS commands that are summarized in unit 8 of the book. It also gives the syntax conventions that are used for the commands, along with a listing of all the commands presented in unit 8. This will help you judge how well this reference book works and whether it is current enough for what you’re doing. This file contains the source code for the 5 model programs presented in units 5 and 6 of the book. This file also contains a Word document named Readme.doc that summarizes the components of each of the 5 programs.